In an opening statement, the APWU offered its perspective on the case: The Postal Service’s decision to allow Staples employees to perform the work of USPS retail clerks was motivated in large part by management’s desire to save money on labor costs. The union was never offered the opportunity to negotiate over the program, and therefore the USPS violated its duty to bargain in good faith. The Postal Service asserted that the goal was simply to expand customers’ access to retail services and therefore, management had no obligation to bargain with the union over the program. But the first and only witness of the day, APWU Manager of Negotiations Support Phil Tabbita, testified about numerous USPS documents that revealed that management’s goals in the Staples program included reducing labor costs by transferring the work of window clerks to Staples employees. He was questioned by NRLB Region 5 General Counsel Daniel M. Heltzer, who is representing the NLRB in the complaint against the Postal Service. The Postal Service’s attorney repeatedly objected to the General Counsel’s line of questioning, but Administrative Law Judge Paul Bogas overruled the majority of the objections. The Postal Service claimed that two of the internal documents were so confidential that the hearing room had to be cleared of observers before Tabbita could be questioned about them. Judge Bogas temporarily granted the request to keep the documents sealed, but said he would revisit the designation later. The judge’s ruling prohibits the APWU from reporting on the documents, at least for now. 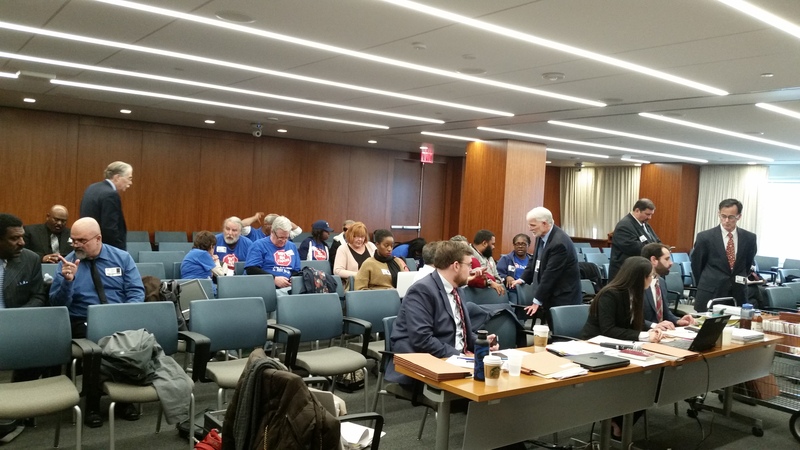 Among the observers cleared from the hearing room were activists from New York, Philadelphia and Washington, DC, wearing Stop Staples T-shirts. “We came because we want to preserve postal jobs with good benefits and not give them to low-benefit jobs,” said Carol Thomas, a retired Training Technician from New York. “We wanted to show our support for the cause,” added Rosa Greene, a retired Window Clerk. The case arose after the APWU filed an Unfair Labor Practice charge with the NRLB. The hearing is expected to continue for several days.